This week, I have had the privilege of reading some amazing & awe inspiring blog posts. Posts from women that have broken my heart, brought tears to my eyes and given me an overwhelming sense of hope & inspiration, all within a matter of paragraphs. Reading what I have been able to read this week, from more amazing women than I can count, makes this post hard for me to write. How do you follow up to that? Plain and simple, I can't. All I can do is tell you my story. When I started this blog a few years ago, I was escaping from a much more public presence on the interwebs, where family and friends galore were reading. I chronicled my first miscarriage on that blog. What followed was a depression so deep, that getting out of bed most mornings seemed impossible. When it came time to start our infertility treatments, I got scared. Not only was I severely depressed, I didn't want people I knew in real life to know about our sperm counts and how many trips to see "Wandy" I had been taking. It was personal. I only knew one other person at the time who was going through infertility treatments -- I was scared of what was to come & felt very alone in the process. So I started writing here to sort of save myself from what I thought, at the time, was an embarrassing situation. My battle is different from many of the stories that I have read this week. So many of the women I know have gone through years of fertility treatments to have their babies, or continue to fight this disease in hopes of one day becoming a family of three. Our journey, in the infertility world, was short lived. One round of clomid. Two rounds of Femara. One IUI with one little follicle that brought us one amazing miracle. I know that on so many levels I cannot possibly relate to what so many of my friends have gone through, continue to go through, and would never, for one second, compare my struggles to theirs. Pain is pain, no matter how you look at it, but I am lucky. I know this and I thank the stars every day for what we have been given. I can only share what we went through get here. The years of trying naturally. The miscarriage that broke my mind, body and soul. The waiting ... waiting ... waiting for my husband to return from Iraq so that we could try again, while so many people around me got pregnant. The friends who had miscarriages the same time I did who went on to get pregnant again, successfully, while I was still playing Army Wife. The tears. So many tears. And so alone. When we started our fertility treatments, I quickly started finding fellow IF'ers on twitter and through blogs because I needed to. I had no one who understood this. This community? They saved me. Suddenly, there were others. SO MANY OTHERS who knew this pain. Who had been through what I had been through. An astounding ONE in EIGHT couples battle infertility on some level. There are so many reasons why couples struggle with infertility, and so many ways to help build that family you are dreaming of (oral medications, IUI, IVF, FET, surrogate, gestational carrier, adoption, embryo adoption, sperm donation, egg donation) but the emotional and physical toll these procedures take on couples, not to mention financial, are just as extensive. Finding these women was one of the best things that has happened to me. It has brought me some of the most amazing friendships that I could ever ask for -- women who, no matter what, will drop anything for you to be the support you need. People that I love, without ever having met them face to face, and people that love me back. Friendships that I will carry with me for the rest of my life. These women are an inspiration to me, more than they will ever know. Every day they fight to make the infertility world better. 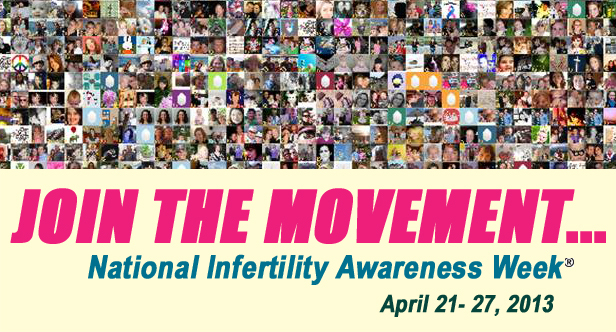 They fight to make sure that infertility becomes less of a taboo topic and more of an open discussion. They FIGHT for the right of others to have better access to treatments. It is a community that I am proud to be a part of, even though I do not say it enough. They taught me early on to not be ashamed of what we were going through. That it SHOULD be out in the open. THAT is what I want to do in return. This year, RESOLVE's theme was "Join the Movement ..."
The goal of this year's Blog Challenge is to bring together bloggers to talk about how you are making the difference in ways large and small in the lives of people with infertility. Topics covered in your blog post can include how you broke the silence of infertility in your life, how you advocated for the infertility community, how you advocated for yourself, or how you created a support community to help you through the infertility journey. I will be the first to admit that I do not do enough for this community. I always want to do more. So much more. But I don't. I can give you a million reasons why, but I will save you from that because the fact of the matter is there is no excuse. So, for now, I do what I can, which is lending support. I can do support. I can do hugs. I can give so, so much love. I can be a shoulder to cry on. More than anything, I can encourage and supply HOPE when hope is nowhere to be seen. I do not EVER want anybody to feel the way I felt after my miscarriage. To hit a rock bottom below the rock bottom. To be so afraid of leaving your house because of what might go wrong. To feel like you have nobody there to pick you back up. That depression post-miscarriage was the lowest point of my life, and is it a low that I never want to see again. Nor do I want any woman to feel even a fraction of how I felt. So when I can? Whether it's a message or a hug or a phone call ... I will be there. This is what I do, or what I try to do, on a daily basis. Going forward, I am vowing to do better. I want to give more to the community that has already given me so much, and I am looking forward to what the next year will bring. This is the first year that I have truly been in touch with what has been happening in the NIAW world, and as I said before, I am in awe of who I have the honor of associating with. I hope I make my friends proud in being a better advocate for the community that has already give me so much. But please, PLEASE don't negate your own infertility struggle by comparing it to others. You have dealt with the pain of infertility just like everyone else. No one would ever say, "oh, I have cancer, but I can't relate to cancer as much as others because they had X cancer." Just because you didn't need as many interventions as some people, doesn't mean your struggle is less valid. Being there and sharing your story is invaluable. And showing off your little one - priceless.